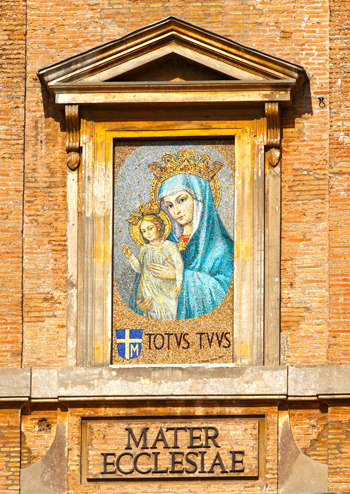 Pope Paul VI, in November 1964, announced his wish to end the sessions of the Second Vatican Council “with the joy of honoring our Lady with the title Mother of the Church, Mater Ecclesiae.” And Paul VI added: “This title will help us to honor Mary Most Holy, loving Queen of the world, source of unity as our Mother, and tender hope of our salvation.” This image, so closely united to the memory of Popes Paul VI and John Paul II, is a good reminder for all Christians, upon seeing it, to ask her to protect all her children in the Church. 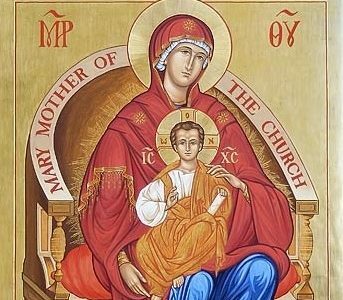 This new feast day, Mary, Mother of the Church on May 21, will be celebrated annually the day after Pentecost, and was announced in a March 3 decree by the Congregation for Divine Worship and the Sacraments. The decree said the pope approved the celebration because he thought it might "encourage the growth of the maternal sense of the church in the pastors, religious and faithful, as well as a growth of genuine Marian piety." The Mosaic Icon of Mary Mother of the Church or Mater Ecclesiae (pictured below) was placed in the Vatican by order of Saint Pope John Paul II whose motto was "Totus Tuus" or Totally yours - which refers to his devotion to the Blessed Virgin Mother Mary.